REUTERS/Alexei Druzhinin/RIA Novosti/KremlinUS President Barack Obama, left, with Russian President Vladimir Putin at a plenary session during the Asia Pacific Economic Cooperation Summit in Beijing on Nov. 11. Russia is ready for cooperation with the US, provided it is based on respect for each other’s interests and non-interference in domestic affairs, President Vladimir Putin said on Wednesday. “We are ready for practical cooperation with our American partners in different fields, based on the principles of respect for each other’s interests, equal rights, and non-interference in internal matters,” Putin told a Kremlin ceremony at which he received the credentials of the new US ambassador, John Tefft. The comments come a day after Putin said the US wanted to subdue Moscow but would never succeed. “They do not want to humiliate us; they want to subdue us, solve their problems at our expense,” Putin said at the end of a four-hour meeting with his core support group, the People’s Front. 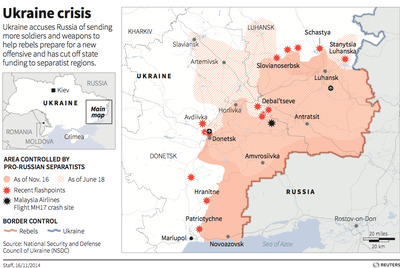 ReutersMap of eastern Ukraine showing the area of control by pro-Russian separatists. Earlier this week NATO Secretary-General Jens Stoltenberg denounced what he called a serious Russian military buildup both inside Ukraine and on the Russian side of the border and urged Moscow to pull back its troops. Stoltenberg said NATO saw movement of troops, equipment, tanks, artillery, and also of advanced air defence systems in violation of a cease-fire agreement. Russia denies providing arms or troops to support a separatist pro-Russian rebellion in eastern Ukraine, which began after the removal of a Kremlin-oriented Ukrainian president by mass protests in February. 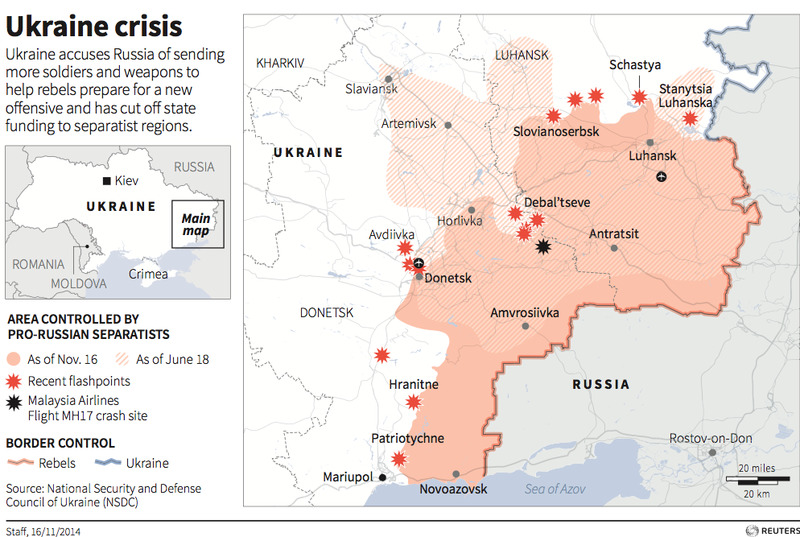 A cease-fire was agreed in early September, but fighting flared again recently.